It is as much fun as windsurfing, but without falling in the water. The speed is a little bit slower and with much more comfort and relaxation than standing. Plus, you can always stop, drop anchor and go for a swim or lay down and sunbathe! Does this sound too good to be true? 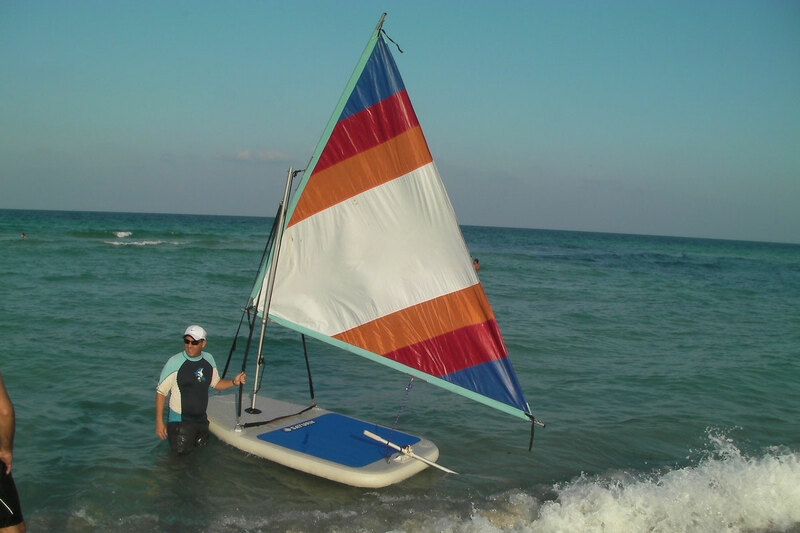 \r\nThe Saturn Inflatable Sail Board is a very stable alternative to traditional boards. It is perfect for outdoor water sport activity on a windy day. Sail assembly will take only a couple of minutes with a short learning curve. Then all you need is sail breeze up to a maximum of 15mp/h and a sunny warm day. Users can sit directly on the board, or place a beach chair on top and travel in comfort! \r\nYou can ride it over the beach surf with ease. You can also stand up if you need to reach the mast. Even if it overturned (which is not easy), you can swim around, and pull down on the raised side to lift the sail out of the water. \r\nWhat makes this product unique, is a built in round mast opening, and 4 large directional fins glued to the bottom, which act as a sail boat keel. No complex assembly needed. Just unroll the sail board, pump it about 20% to keep its shape, insert the mast support into the hole and keep pumping until the fabric surface is hard to the touch. The mast support will get squeezed tight into the hole, once board is fully inflated. \r\nPlease note that this is a new product, still in development, and there are could be some aspects that may need improvements or customer's improvisation. We will appreciate any comments or feedback you can provide us with this product.